« Sue Baldassano Asks: So you want to be a Culinary Tour Guide? Nicole Fallon Croes is a recent graduate of Chef’s Training and an ongoing contributor to Blanched and Shocked. 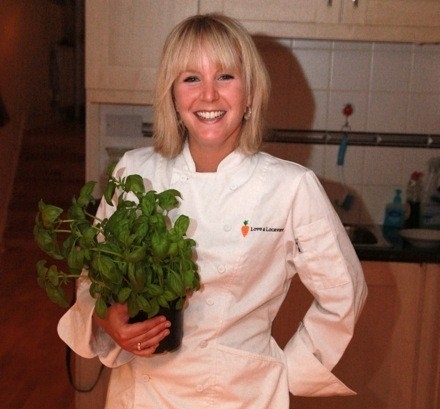 She recently moved to London, where she met CTP graduate Alice Bamford of Love a Locavore Catering . . .
Like most good stories, this one begins on a dark and stormy night. I had only been in London for four days when I embarked on an hour-long trek from my temporary-housing unit in East End to Alice’s home in Fulham. Come hell or high water (literally), I was not missing her dinner. Not only was it my first chance to eat a proper meal since moving from New York, but it was also an opportunity to meet a fellow Natural Gourmet grad and attend her exclusive pop-up dinner. All the rage in new-aged dining, “secret” or “pop-up” dinners are staged at various locations, where only a select few can enjoy a coursed meal designed by the hosting chef. I had heard of the concept in passing, but assumed this type of event was reserved for food critics and celebrity chefs. The term “pop-up dinner” conjured up images of well-heeled, ultra-fab elitists eating in a dark room at an unmarked location, as if rebelling against food prohibition. I never actually pictured myself in a two-story home in West London, eating a locally-sourced meal with some of the friendliest people in town. When Chef Elliott “virtually” introduced to me to Alice via Facebook, I soon discovered that pop-up dinners could be really down-to-earth. See, Alice produces her dinners under the umbrella of her Love a Locavore catering company, specializing in as much seasonal and local food as possible. Most of her ingredients are typically sourced from either suppliers located within a 150-mile radius of her kitchen in Fulham, or her parents’ kitchen in Gloucestershire, where she also has access to produce from her very own kitchen garden. Even though each dinner is different with respect to the season, one thing remains the same—Alice is passionate about good, clean, environmentally-conscious cuisine. 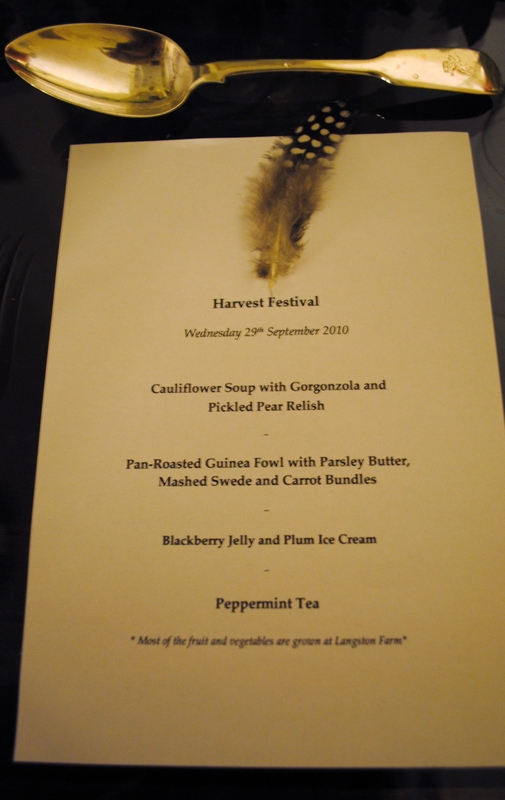 I had the privilege of attending her September Harvest Festival celebrating fall’s bountiful crops. Alice welcomed guests with an assortment of homemade canapés. 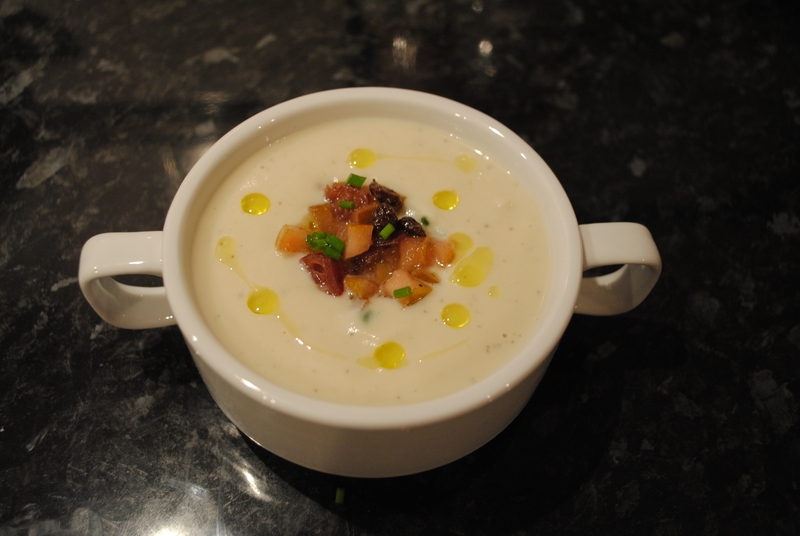 Wine and conversation were flowing by the time we sat down to our first course that included a creamy cauliflower and Gorgonzola soup drizzled with pickled pear relish. 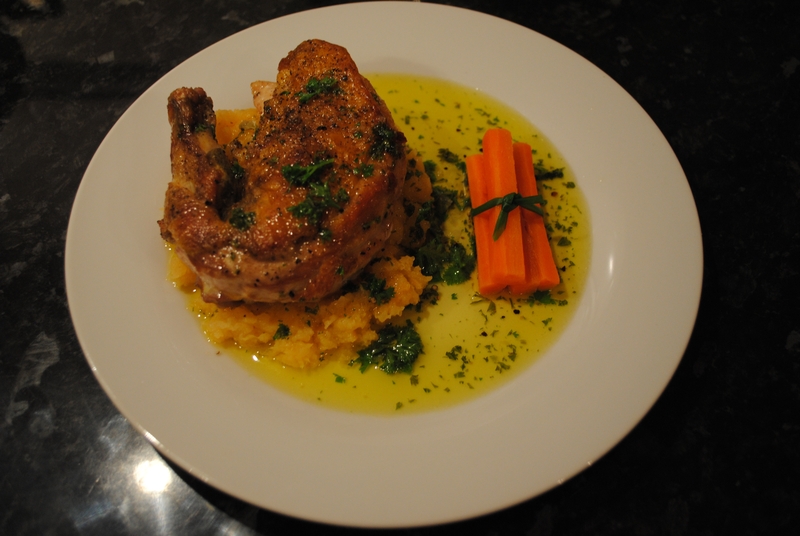 The pièce de résistance came in the form of roasted guinea hen, accompanied by fancy carrots, mashed swede (rutabaga) and parsley butter. 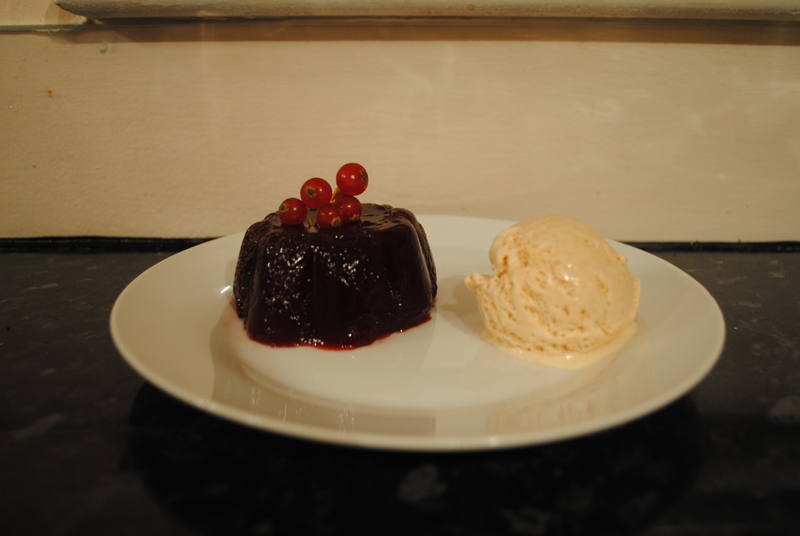 By the time Alice presented us with dessert, I swore I was too full to finish it, but alas, there wasn’t a drop of homegrown blackberry jelly or plum ice cream left on my plate. The evening concluded with fresh-picked peppermint tea and the pleasure of Chef Alice’s company. It was a night to remember for all of us, especially for me, who had flown clear across the Atlantic and still managed to find a little piece of home. I’d like to give thanks to Alice for being an inspiration to the Natural Gourmet community and foodies everywhere. It takes a very rare and special person to draw the crowds and excitement that she does, especially on a wet weekday night. I also have to mention that her most recent Evening of Comfort sold out in a record-breaking four hours. It just goes to show that people really do love this Locavore! Become a friend of ‘Love a Locavore Catering’ on Facebook or go here to find out more about Alice’s catering company and upcoming pop-up dinners. www.lovealocavore.com is coming soon!